As it happens, surprisingly, I haven’t had the biggest sweet tooth during this pregnancy. Not that I’ve had any sort of aversion to sweets – oh no, not at all – I just haven’t been craving them… not even to the same level I did pre-pregnancy. Give me a Luigi’s frozen lemon, a spoon, 2 cuddly pups, a sweet husband, and MasterChef on the television, and I’m a happily growing camper. But I have missed baking. So after a particularly sweaty workout on a quiet evening, I decided it was high time to just go all out. I’d mustered up just enough energy for one dessert confection, and it needed to be a good one. I initially defaulted to chocolate chip cookies – standard, easy, omni-delicious (that means delicious everywhere, all the time). Then I decided that maybe s’mores would be good. Or brownies. So, with little miss fetus calling the shots, we combined all of the things that might be tasty into one casserole dish and invented… these. In fact, I didn’t even have a name for them. I sent some to the bakery with David and brought the rest with me to share with my coworkers. Naturally, our department’s copy writer dubbed them Smoresagna (s’mores lasagna, in case two words mashed together don’t leap out at you), and I felt like nothing could be more apt. These are cheap, easy, and well worth the effort (there is no effort involved. These are the easiest.). Preheat oven to 375. In a bowl, cream Crisco and both sugars. Add eggs and vanilla, stir until combined. Add baking soda, salt and flour, stir completely. Stir in chocolate chips. In a casserole dish (mine was a funky shape because my 8″ x 8″ casserole dish was dirty, and I only had energy to bake… not to clean… but I do recommend an 8″ x 8″ or 9″ x 9″), line graham crackers along the bottom of the dish, covering completely. Add half of cookie dough, spreading across graham crackers. 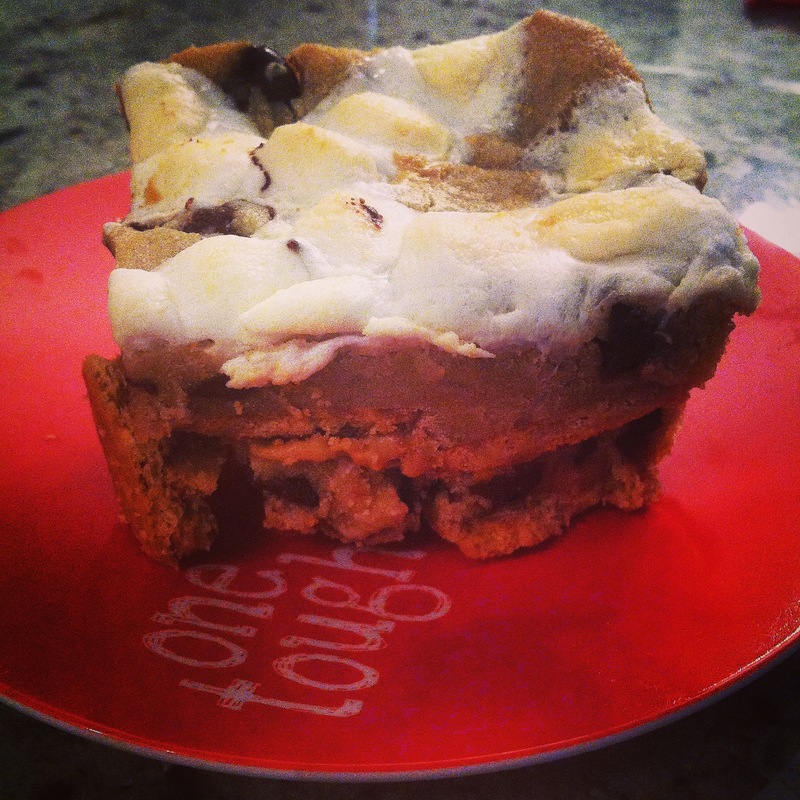 Top cookie dough with layer of peanut butter – amount optional. Add another layer of graham crackers on top of peanut butter. Add remaining cookie dough on top, spreading smoothly. Bake 8 minutes at 375. Remove from oven, lower heat to 325, top the casserole dish with desired amount of marshmallows. Bake 10-12 more minutes at 325 until marshmallows are toasted and cookie layer is golden. Allow to cool completely before cutting.